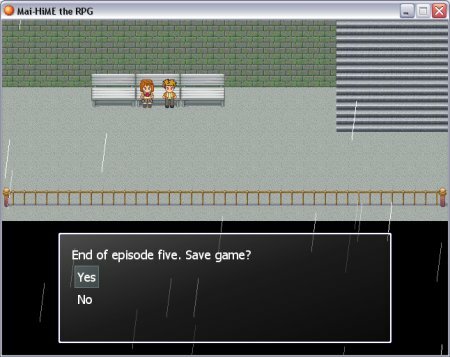 I wasn’t particularly looking forward to doing episode five; in my mind I think of it as the ‘angst episode’ in which nothing really happens- not to mention the fact that it required no small number of new sprites and locations. 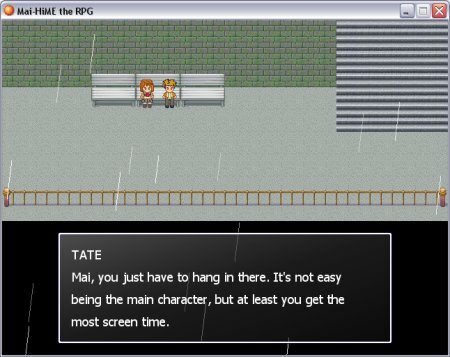 Fortunately, it all went better than expected, and thus I can present to you the RPG version of episode 5. 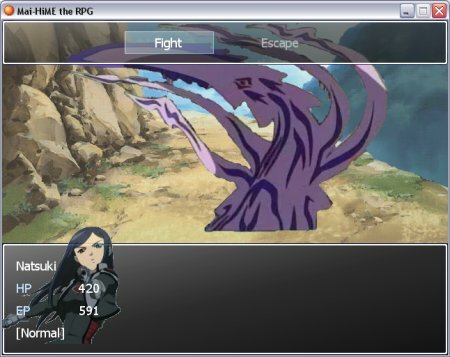 I’ve also continued to clean up a few things from earlier episodes, whilst fanboys will be pleased to hear that Midori is almost ready to make her debut as a playable character. 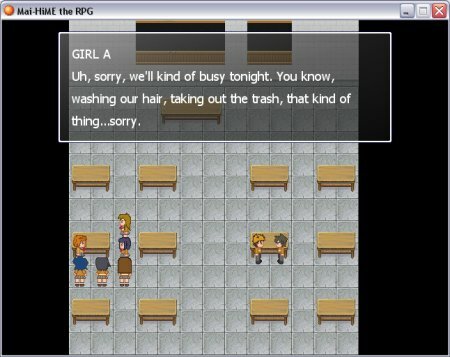 Class is over, and Mai explains why she can’t go out with everyone else. Mai’s friends come to visit her at Café Lindenbaum. I had to use an industrial tileset for the station, so it looks a little grey and uninviting. 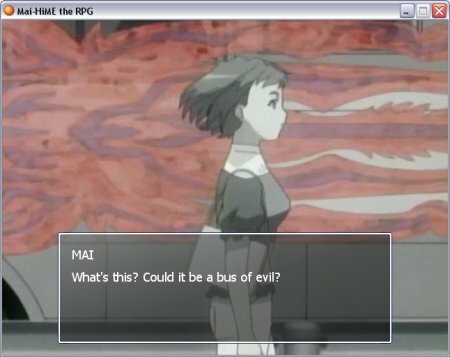 On the way home, Mai encounters a bus of evil. Ironically, when Mai is free, everyone else decides they are busy. Mai decides to go out by herself. This battle wasn’t seen onscreen in the anime, but I included it to make the episode slightly more exciting. 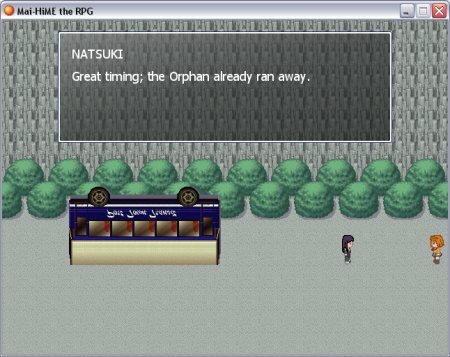 Fighting with Natsuki alone makes it tougher than usual, but the Orphan runs away after five turns. Mai arrives in time for some more exposition. Mai and her classmates reconcile. 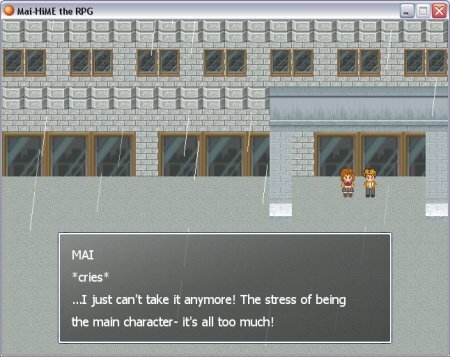 Mai sustained cheerfulness finally becomes too much for her. Tate buys Mai a canned coffee and comforts her. Next episode should be more interesting. 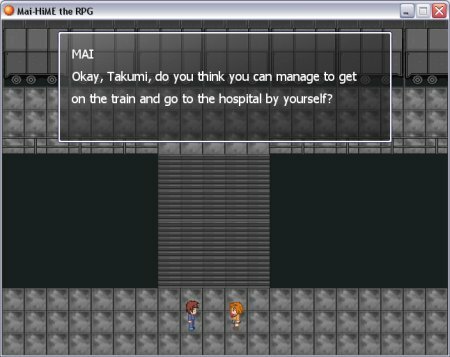 This entry was posted in Mai-HiME: the RPG and tagged Mai-HiME. Bookmark the permalink. On an unrelated note, I’m sad for Aoi and her classmate (which I don’t remember the name) at Café Lindenbaum, because they are sitting far away from the table and cannot reach the bread which is on the other side of the table. Life is not fair. 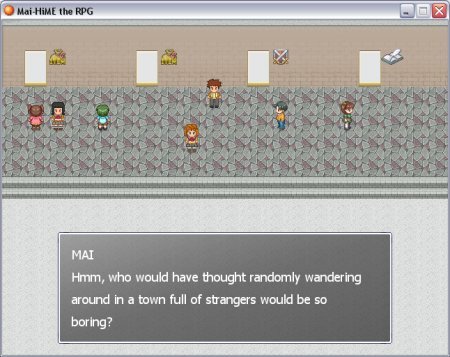 Parodies are the way forward…I’ve actually been working on another project on and off, it’s a spoof of classic RPGs entitled “Fantasy Legend Adventure”. 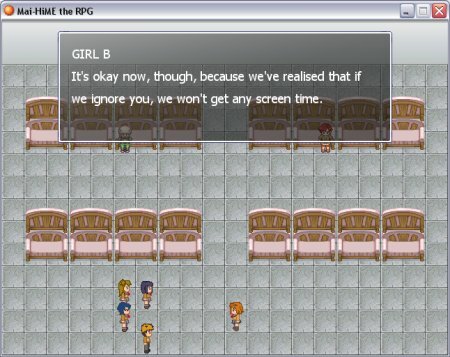 I don’t think Aoi’s classmate has a name (I call her Girl B in the RPG but think of her as Yayoi since she looks like a blue-haired version of Yayoi from Otome), but RPG Maker is a cruel world where tilesets and sprites rarely let you sit down and never let you eat. Edit: fixed the chairs so they’re closer to the table, now they can have some bread too.